I’ve been terrible at writing something about fostering Macon this past week. During the week it was pretty much the same thing – get up, do our routine, crate him, leave for work, come home from work, let them play out back, maybe take them for a walk, etc. There were a few days that we didn’t get walks in because when I came home, I had to deal with the contractors work on my shed. One night I know I was helping them past 8pm. Yep, I’m out there holding a flashlight so they can do their work. Ugh. Friday morning arrived and I woke up to it raining. I laid in bed wondering if Macon would be like Sadie and not want to go out in the rain. I was asking myself if he doesn’t potty, will he make it the entire day or should I come home at lunch to let him out. When it was time for them to go out, Macon went out no problem. Sadie stopped at the door and said “nope, not doing it.” The rain picked up a bit and needed to get Macon inside. Knowing he would be wet, I grabbed a towel so I could dry him off. I called and called Macon and like before, he doesn’t respond. I grab my umbrella and walk out on the deck. He finally comes up the deck stairs and I quickly grab the towel to wipe him off. He is muddy and wet. Gross. Now it’s time for the crate. I put peanut butter on the Kong toy like I did the day before, and let him lick the treat so he knew what was there. I tossed it in the back of the crate and this smart boy didn’t budge. Well crap! That idea didn’t work well. I grab some other treats and throw them in hoping he would get a little closer. He did and I was able to them push him from behind. It was like wrestling a wet bear this time. I was in heals and black slacks, trying to push this wet, muddy dog inside his crate. Finally he went in and I quickly shut the crate door. Oy! I get home later that day and let them both out back. I’m sitting in my living room and and I hear this sudden noise from outside. I realized that it was a downpour and both dogs were outside. I rush to the back door and call Sadie and Macon and neither respond. I get my boots on and grab my umbrella…again, and head outside. I call Sadie and she finally come slinking up the deck stairs, ears down, body low to the ground and gets as close to the back door as possible. I let her in and dry her off. Macon comes up and he is super muddy and soaking wet. I do my best to get him dry and cleaned off but he had so much mud in his paws. My hardwood floors look like a paw print painting. At this point I figured I would clean the floors once the outside was all dry and the inside wouldn’t continue to get muddy. Saturday morning I woke to a strange sound in my bedroom. I sat up in bed to find Macon shredding Sadie’s bed. I grab the bed and the stuffing and placed it on my bed. As I’m getting out of bed and go out to the dining room area, I see that Macon is now getting ready to work on my cat’s bed. I quickly grab that and put it up high. I see his 10+ chew toys all over the floor yet he didn’t want any of them. I put them both out side so I can get showered. Now remember, the outside is still pretty wet. Fun times. At this point I’m feeling at my wits end, wondering if I am strong enough to continue fostering him. I was told he was crate friendly – not, I was also told he had low energy – not! 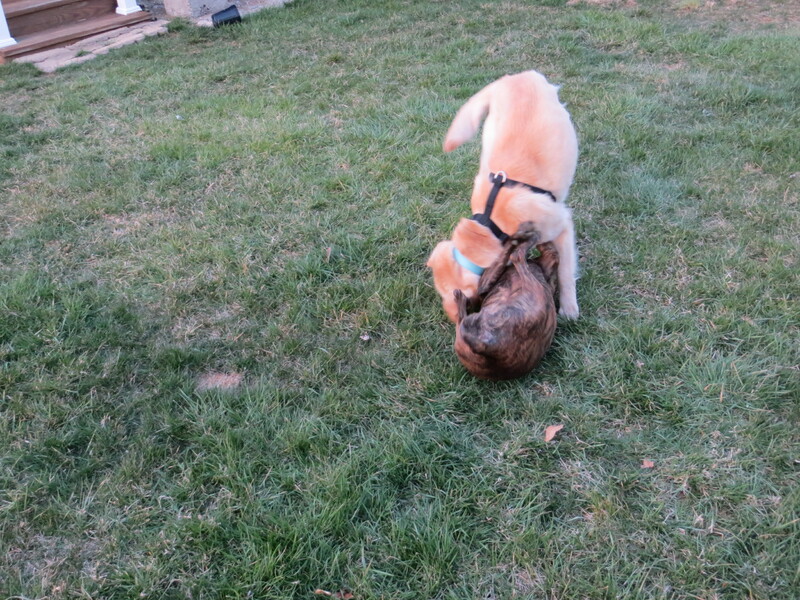 He always wanted to play, which Sadie loved but I was beginning to think it was too much for me. I emailed a lady at the rescue and shared my feelings and thoughts. She said she would try and find him another foster. Sunday the rescue was holding an adoption event and I wanted to make sure that Macon was there. He really was a great dog and everything I was feeling were my issues, not his. He was doing what dogs do. I was the one who was having trouble adjusting. I’ve never had to crate a dog, I’ve never had a dog that chewed everything in sight, I’ve never had a dog with so much play energy. It changed everyone’s routine and dynamic. My cat who is losing weight by the minute due to hyperthyroidism and kidney disease didn’t eat for three days. So Sunday morning I use wipes to get off any mud and dirty spots off Macon. I brushed him to make him nice and fluffy and pretty. I gather his blue folder, some treats, put his harness and leash on and we load up in the car. Sadie barked as she wanted to go with us but I couldn’t bring her. We arrive at the event and we are the third dog there. We find a nice place in the sun to stand away from the main area. Now we wait. He had several people come up and pet him, ask for his story, and contemplate adopting him. A family came over who had two sons, one 5 yo and the other is 13 yo. The mother fell in love with Macon. I told his story and they asked if he was good with kids and cats. I said he is great with kids, cats, dogs, chickens, etc. They asked how he is when he’s crated and what he eats and likes to play with. I brought three marrow-less bones that he loved to chew on where Sadie doesn’t like them once the marrow is gone. They had a family meeting and came back with great news – they wanted to adopt him! They went inside the pet store and bought all the necessary supplies, filled out the paperwork and we all went our separate ways. I was happy, sad, and relieved at this point. Macon and I had a moment when the family went shopping for us to say our good-byes. He put his head in my lap and just stayed there while I gave him hugs and whispered in his ear that Sadie and I would miss him. He really was a great dog. 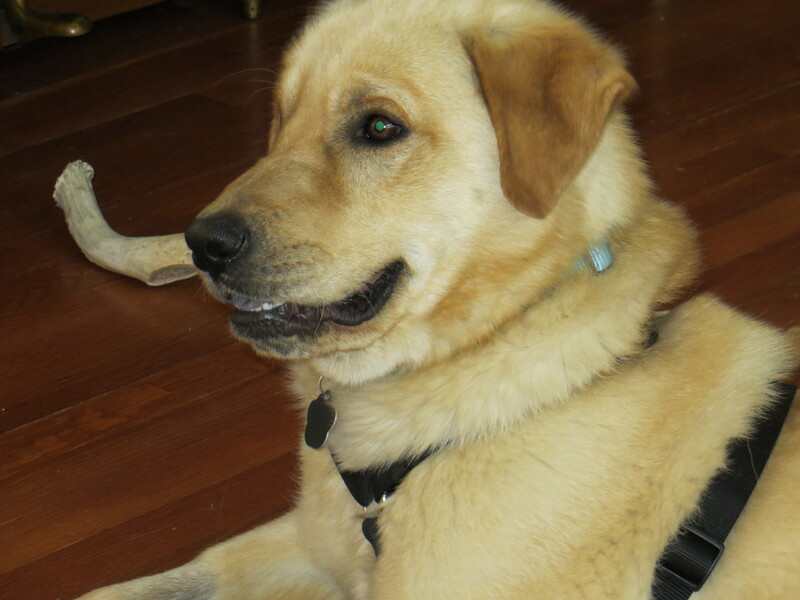 Macon’s name was changed to Mason and he found a great forever home with two boys who will enjoy his energy and his great character. Yesterday I spent some time breaking down his crate to return. I returned two baby gates and then rested. Tonight I’ll mop the floor and get the mud out and hopefully this week the household will go back to normal. Sebastian ate all his food last night and all of it this morning. Maybe I can’t foster until Sebastian, Molly (mom’s cat) and mom are not present in the house since it does change the dynamics with everyone. Day 3 started out with a different morning routine since I had to go to work. I woke up extra early knowing I would be doing some things differently. Plus my mom’s friend was in town and I had to take her to the airport on my way to work. In the beginning I would separate the dogs during feeding time. Not because either of them are food aggressive, but when Macon is done eating (and he eats much faster than Sadie) he immediately goes over to Sadie’s bowl to finish that off. So lately I prepare both bowls at the same time and put Sadie’s down first and then put Macon’s down. When Macon finishes, I make him sit next to me and wait until Sadie is done. When she is done, I release Macon from Sit and he goes over and licks out Sadie’s bowl. I’ll continue to work on this with him. While I wait for my mom’s friend to come upstairs, and while I have my coffee, I sit out back with Macon and Sadie and watch them play together. 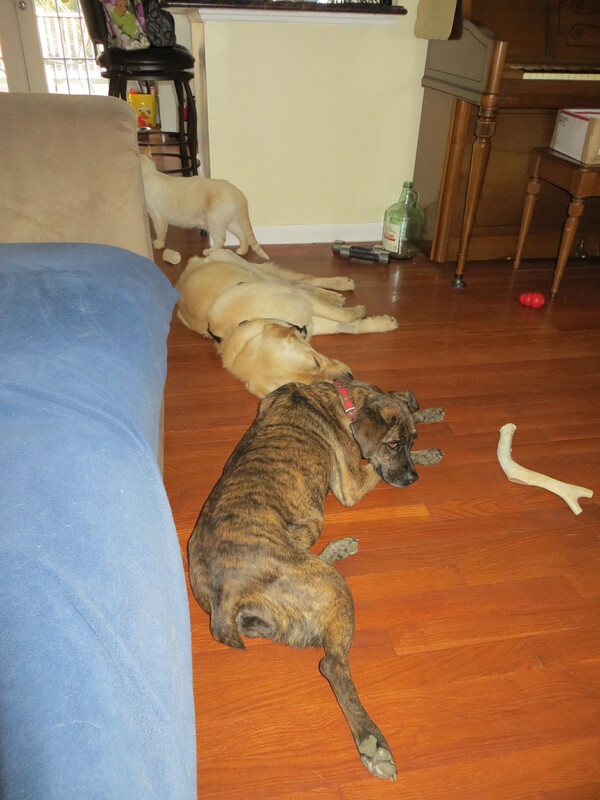 At this point I’m hoping they play, get tired, and then sleep most of the day. Coffee is done and it’s time for me and my mom’s friend to head out. So now it’s crate time. My favorite time. He really doesn’t like the crate. It is always a struggle to get him to go in. Finally I manage to get him in and close the door. He starts barking as we exit the house and I feel really bad because I can hear him all the way outside. I know he’ll settle down. Plus I planned on coming home at lunchtime to check on him, let him out, and check on the workers putting my shed up. It’s lunchtime and I head home wondering if he made a mess in the crate, or somehow managed to escape. I pull up and the workers are in the back yard. I go out back and let them know I’m here to let the dog out on leash. One of the workers is terrified of dogs. I close the gate and head inside. Macon is laying calmly in his crate until he sees me going towards him. I get his leash and we head out back. Just him and I. No Sadie. I didn’t want distractions because I wanted him to do his business. And he does. Not it’s crate time – again! Push, push, push and finally he goes in. Back to work. After work I get home and he is so excited to see me. We all go out back and they play and play some more. So nice for Sadie to have a friend. She is LOVING it! I didn’t get them both on a walk like I had planned since I was busy installing a baby gate at the top of my stairs. My house is a split foyer with banisters. I found a baby gate that can be attached to the bannister without having to drill. I realized to do this I need two more arms. Luckily my mom got home and helped me hold it in place while I put all the pieces together. I got two other metal baby gates, one for the hallway and one for the kitchen. Neither worked very well so I plan to return them. I wanted one for the kitchen so they can eat separately or if we are in the kitchen, they won’t be. But it was too tall and the granite counter island thing was too low. The one in the hallway worked except I completely forgot about my cat and there was no way for him to get to the bedroom where his food is. So now I get to package them both up and return them. Maybe all I need is the one for the top of the stairs. Who knows. We head out back one last time before bed and it was another night with Macon not needing the to be in the crate. I wasn’t sure if the first night was a one time deal or if he would continue to be good at night-time. Took a risk and we tried it again. He slept so well and never left the bedroom. Sadie slept out on her Chaise lounge and I’m not sure where my cat, Sebastian was. I think Macon is settling in nicely. No photos for today but I hope to get more soon. I know this is a little after Day 2 but I did promise I’d write about it. Picking up where I left off with Day 1, we slept until about 10am which I was very surprised with. We went out back and I let them play a bit but was still a little worried. So that didn’t last long. I tried to get a few things done around the house but with a Macon shadow, some of that was difficult. We decided to go for a walk around the block which is .65 miles. I wanted to take Sadie along too so I suited them both up and we headed out. They walked great together. Macon was eager to explore and smell all the new smells. He could have probably gone longer but with his surgery I didn’t want to push him too much. By the end of this walk, both dogs were walking slower and you could tell they were both tired. We headed back inside where they both took naps. I think I actually included some of the photos on Day 1. It’s all a blur…LOL. I had a meetup event at the dog park and I wanted to take Macon, however the dog park doesn’t really like dogs to be leashed and Macon would have to remain leashed right now. So I left him at home with my mom. She said I didn’t need to crate him, that she’d watch him. So Sadie and I headed out. To keep Macon from going downstairs, I laid down one of my metal swivel bar stools but when I left, he managed to figure out how to jump over that and head downstairs. My mom took him back up and ended up crating him. Poor guy. He just loves to be around people so much that when he discovered that there was someone downstairs he wanted to be down with her. Sweet huh? I only stayed at the dog park for about an hour. I didn’t want to leave Macon for too long, plus some of the dog in the park seemed to worry me so with the stress level I was at, I couldn’t handle any kind of bad incident. Sadie was tired anyway so we headed back home. Macon was so happy to see both of us. I took them out back and they played for a while. 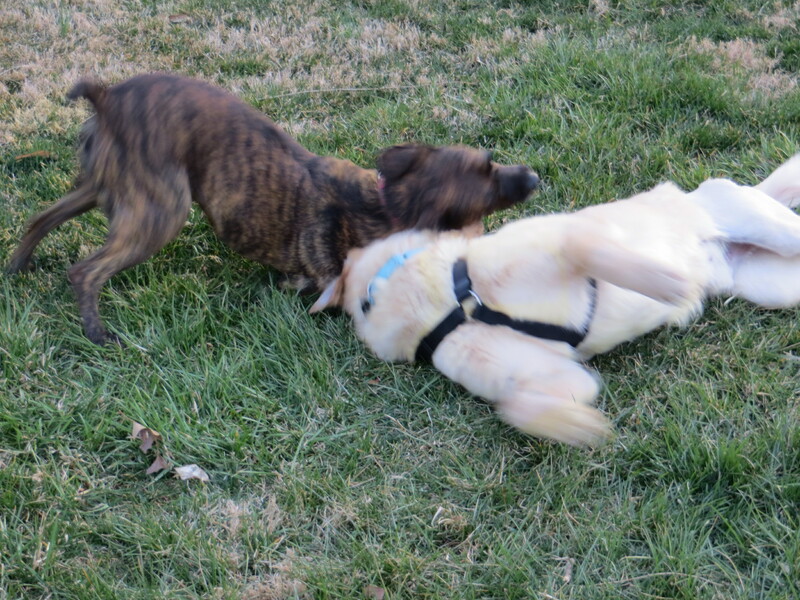 After watching the dogs at the dog park, I thought that I just need to let them play and work it out between them. So I had my camera and I took many pictures of them playing. The fact that Sadie and Macon would lie on their backs, belly exposed, was a good indication that they were both okay. Yay! Below are a few photos. <–Check out Macon’s photo collection! Now we approach bedtime and I’m wondering if I really need to crate him for the night. We had such a great day and he was such an easy dog, that I thought, let’s try it. Worst case, if he didn’t do well, then I’d crate him at that time. I take Sadie and Macon out back to play and do any deeds that needed doing. We head back in and I get ready for bed. I go back into my bedroom and Macon was up on my bed, heading toward the cat food located on the night stand on the other side of the bed (that was blocked off!). I quickly grab him and try to remove him from the bed. It was like trying to move a smart car. After a few minutes he was finally back on the floor. I finish getting ready for bed and say my good night’s to Sadie and Macon and crawl into bed. Macon paced the room for a bit, went out to the kitchen to get some water and came right back to the bedroom and settled down. He slept all night – perfectly! 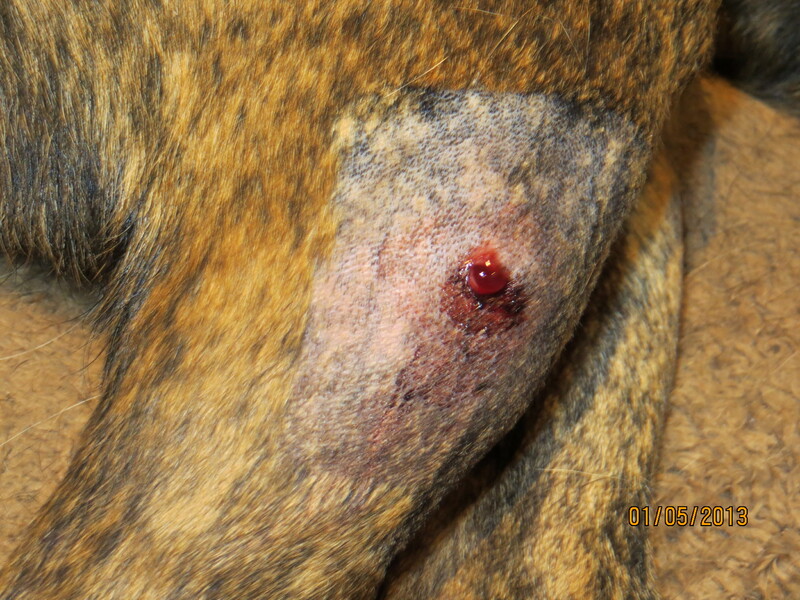 They shaved around the wound so that’s why it looks white. Wouldn’t stop oozing but I followed her around to dab it. Bit more challenging to get a pic of the inside so here’s another one of the outside. My last blog was talking about the thought of fostering a dog. Well this story has me on edge about the whole thing. My friend who just recently started fostering a dog came over on Saturday to administer my home check for the rescue. 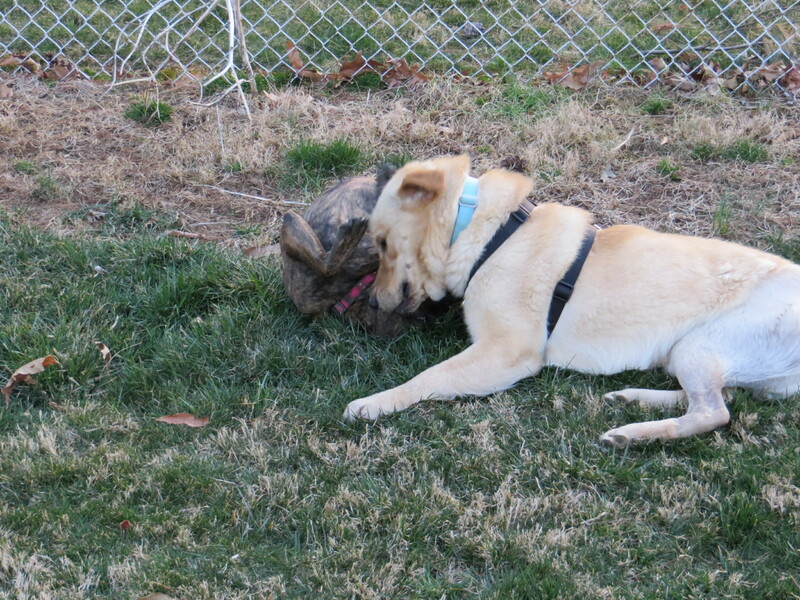 She brought her dog and her foster dog so that they could play in the back yard with Sadie. We ended up out back and watched them play and we wanted to make sure that none of them could escape. One of my worst fears came to life. 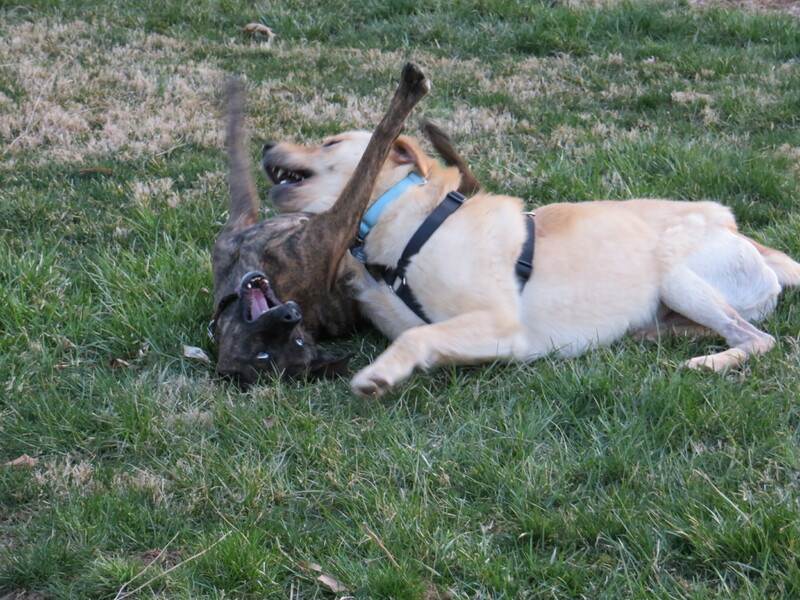 Out of the blue, her foster dog decided to attack Sadie…and I mean attack. My friend grabbed on to her jacket which she ended up coming out of and grabbed a hold of Sadie’s hind leg and wouldn’t let go. I ended up grabbing the fosters collar and wanted to pull – at the same time thinking I don’t want to pull Sadie’s leg off – but what else could I do. Somehow we got her to let go. It was all a blur really. I take Sadie to the deck and shut the deck door to confine her for a few minutes. 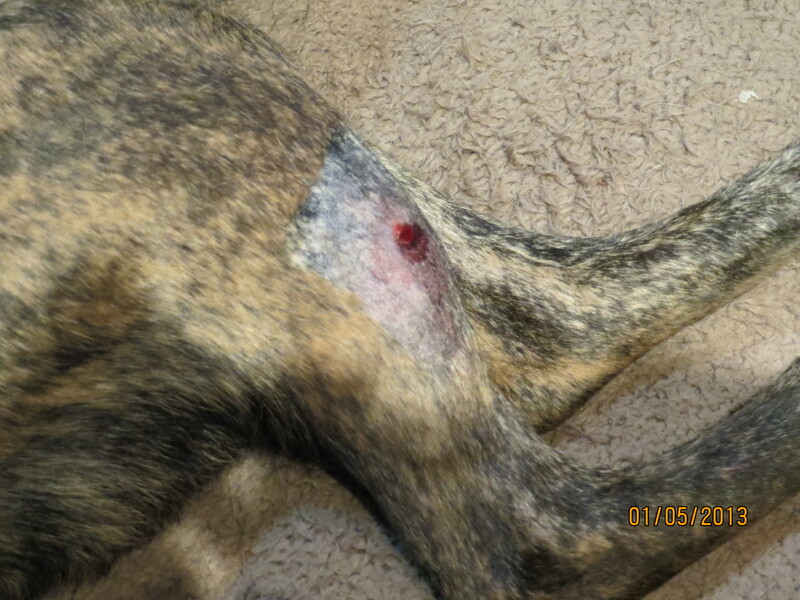 I checked her leg and she had puncture wounds on the inside and outside of her leg – one on each side. They weren’t bleeding at that moment. So I went back to the yard and my friend and I tried to figure out WTH happened! We have no clue, and we’ll never know. One minute everyone was playing nicely and the next it became a nightmare. After gathering ourselves we decided to quickly finish up the home check form. I took Sadie downstairs to be with my mom and locked her in my mom’s living room until we could finish up and get the other two out the front door without meeting each other in the house. I called the vet and they gave an emergency number which happened to be the same number that my friend got for the emergency vet in my town. The rescue group said they’d pay for the vet bills – which they did. 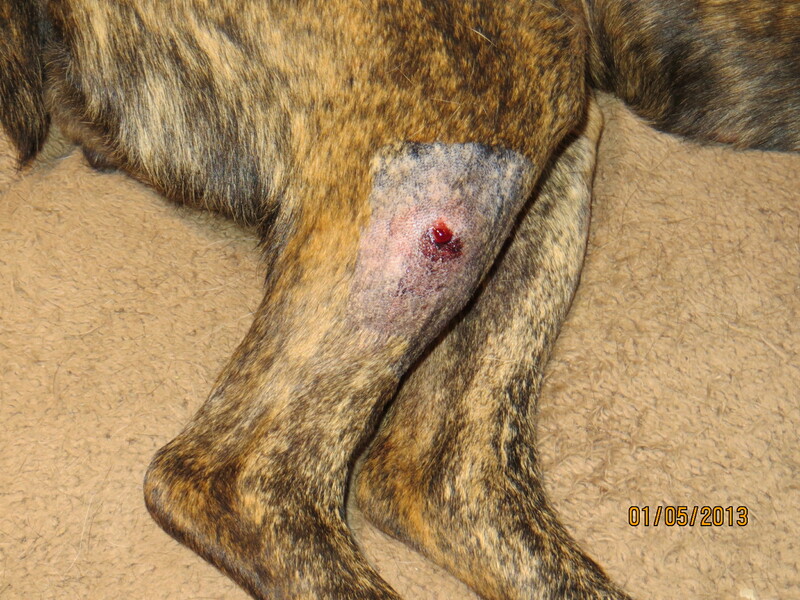 Sadie was given a pain killer which made her not able to walk very well. I took home some more pain killers and antibiotics. I had to do warm compresses every six hours to help with swelling and drainage. 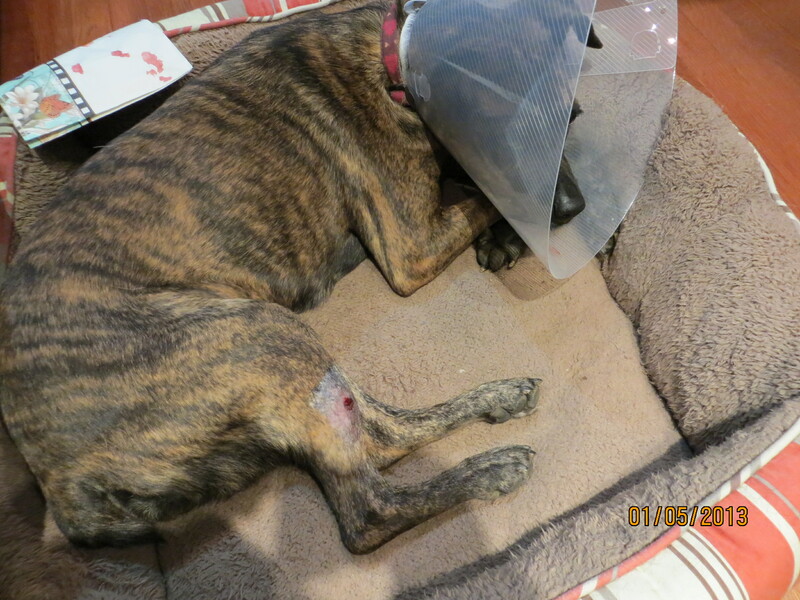 Poor Sadie has to wear a cone on her head because she kept licking her wounds and we need the wounds to scab over. She slept and whined the rest of Saturday and she slept until around 4am. We got up and went outside – I had to help navigate her cone head and help her in her dazed state – but she did her business. We went back to bed and she whined through Sunday night. She has done very well on eating when I ask her too so I can administer her meds (can’t be on an empty stomach) and takes he pills with no fight. Her regular vet called today to check on her and said that I can remove the cone tonight and see how she does. If she licks the areas too often then I’ll have to put the cone back on, but light licking is okay. Nice, normal play is great – rough, aggressive play, not so much. I haven’t given up on the thought of fostering but I am definitely more scared now – with good reason, right? 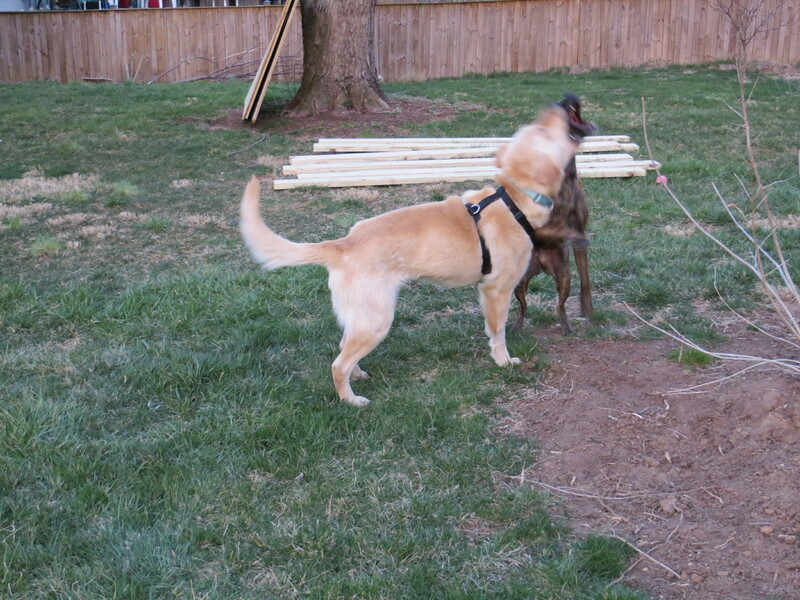 Once Sadie is fully recovered, we’ll get my friend’s dog and her back together – without the foster dog. Sorry girl! It could have been much worse, but it still sucked. Yep, that’s right, like I don’t have enough on my plate right now. But hey, what’s one more thing, right? 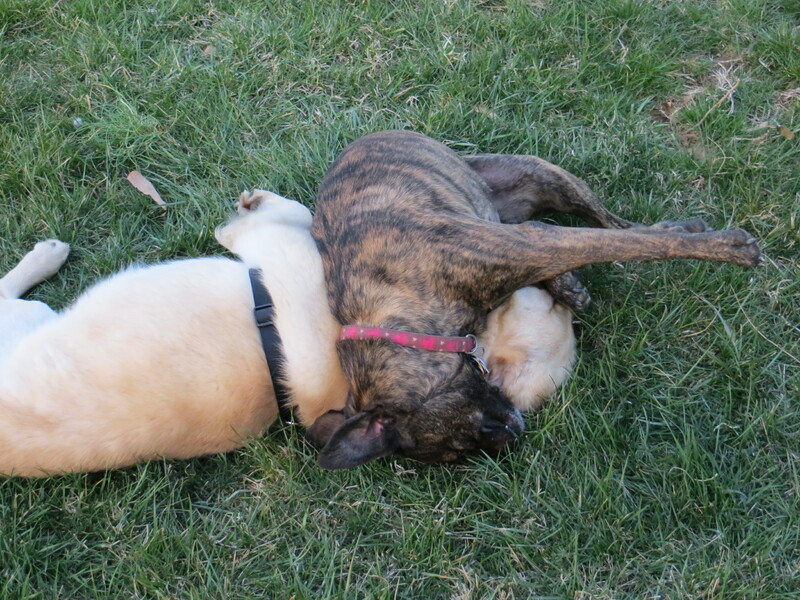 After seeing them play each time they were together, it made me realize that Sadie could use a friend at home. I’d take my friends dog but she won’t let me. LOL So my friend showed me some dogs that are in need of fostering through a place she knew about and where she was fostering her new dog currently. 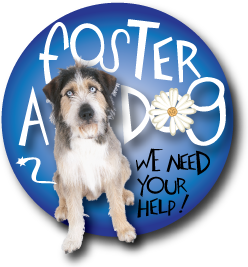 I found a few that I’d love to actually adopt but can’t do that quite yet so fostering is the next best thing – after all, this helps dogs find a good home. I had my phone interview with the rescue place last night and we talked for about 45 minutes. The lady was really nice and gave me a few pointers when it comes to housing multiple dogs and she even gave me a suggestion to help teach Sadie how to chase after a ball. So this summer, we’ll be sure to start working on that! We discussed some of the concerns I have and she put them to rest very quickly. Some concerns were the dog size = crate size, getting along with other dogs and cats in the house, and house-training – mainly because I work 8-5 and could go home at lunch but a puppy would require more frequent potty trips. So the next steps are for my friend to come over this weekend and do a home check and help me brainstorm where a crate could go. In the meantime I have to get rabies certificates for both the cats. Molly should be easy as she would have had to have them for flying purposes, but Sebastian, being an indoor cat, I’m honestly not sure the last time he’s had his rabies shot. So I’ll need to make a vet visit and get that taken care of. If all that is a success, then the rescue will match a dog with me to foster. She did say they like to start off new fosters with a relatively mild and easy dog, and then gradually allowing me to foster more challenging dogs later on. What a relief! I’m looking forward to giving this a try and it will help to have two dogs to keep me busy while waiting during this child adoption process and to provide a friend to Sadie.